Kyoto Gyoen is the national garden, which is 1.3km from north to south and 0.7km from east to west. It is open to everyone anytime. This area was Court Nobles Residential Area in the Edo period. 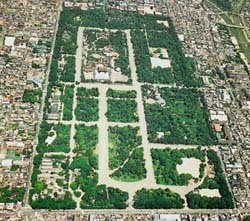 After the transfer of the capital to Tokyo, buildings were removed and Kyoto Gyoen (garden) was established to preserve the Imperial Palace. After The World War ･U, Kyoto Gyoen was changed to be a national garden. Today, there are famous historic spots in this garden including Kyoto Imperial Palace. Also it becomes the place where people could spend their time in nature. Kyoto Gyoen National Garden is open to everyone, anytime (admission free). The following activities are prohibited in our garden. Entering lawn areas by bicycles. The operation and the flight of drones or radio controlled helicopters. Using toys or sports equipment except in designated areas. Picking plants and damaging trees. Please follow the staff instructions and rules for comfortable time in the garden. Every Thursday, Friday & Saturday. The Aoi-Matsuri fesitival, The Jidai-Matsuri fesitival, and open days of Kyoto Imperial Palace. Tea ceremonies, HAIKU and YOKYOKU gatherings can be held by prior application, other than open days, New Year's Eve and New Year holidays. All year, except Mondays, New Year's Eve and New Year Holidays. There are athletic facilities such as playground, tennis and gate ball courts within the park. The facilities can be used by prior application. from "Kyoto Station" to "Marutamachi Station". Approx. 3 min. walk from "Marutamachi Station". From Hankyu Line "Karasuma Station"
from Hankyu Kyoto Line (Karasuma Station). from "Shijo Station" to "Marutamachi Station". From Keihan Line "Jingū-Marutamachi Station"
Approx. 15 min. walk from "Jingū-Marutamachi Station". You will need a pre-authorization of the Imperial Household Agency to enter the Kyoto Imperial Palace or Sento Imperial Palace. For more information, please check the website below. 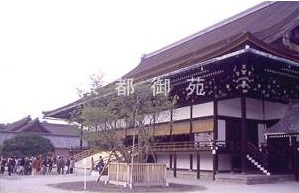 Kyoto Imperial Palace is opened to the public twice a year (spring and fall). For more information, please check the website below.